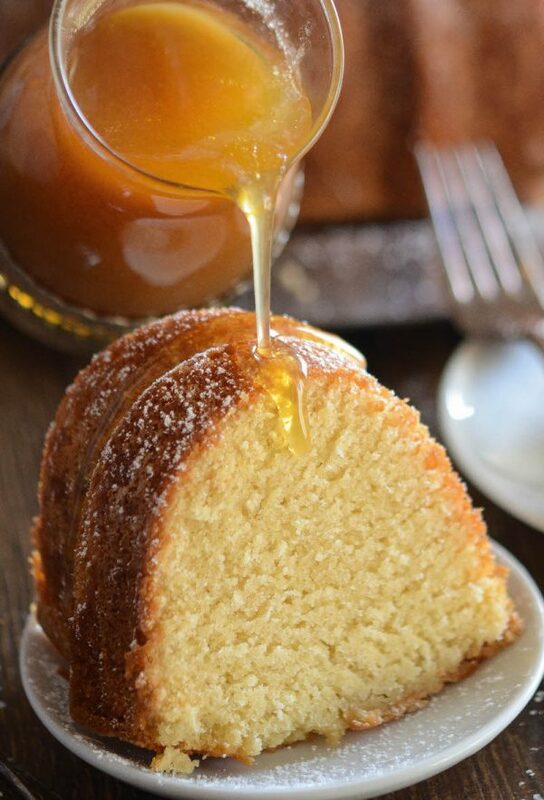 Almond Amaretto Pound Cake: a sweet, moist homemade pound cake flavored with almond extract and amaretto liquor, topped with a warm buttery amaretto sauce. 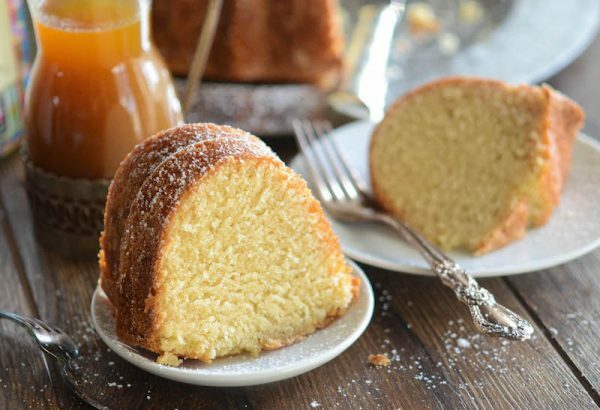 Are you looking for the best poundcake recipe ever? Well guess what, I have it for you! I know you might have heard that before, but I promise, this Almond Amaretto Pound Cake is AMAZING. It is a super crazy moist, perfectly dense, poundcake flavored with amaretto liqueur and almond extract. Then it’s topped with a warm buttery amaretto sauce to really put it over the top. The first time I made this cake I was salivating at the smell coming from my oven, but was still nervous when it came time to cut it. I was trying out a new recipe with more amaretto than I would usually add. I was a little scared that I might loose the traditional pound cake texture and wind up with a fluffy cake instead. Thankfully the first slice I cut proved that the cake was the perfect texture and the smell alone was killing me. I quickly whipped up the sauce for it and we were all on our second slice before I knew what had happened. I have now made this cake 3 times and every single time it has been a massive hit with all of our guests. People literally BEG for the recipe! Seriously, beg. I am not kidding. 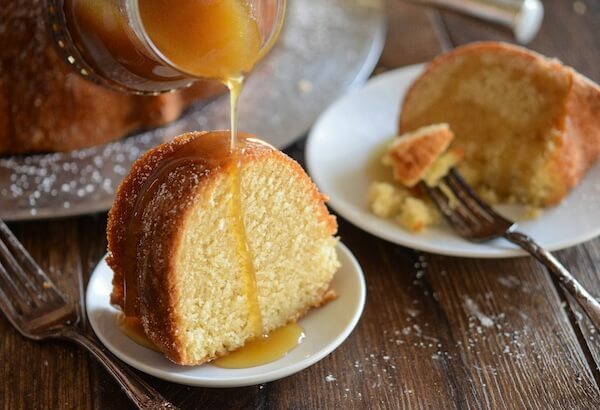 The pound cake alone makes a great breakfast cake, but the warm buttery amaretto sauce transforms it into an impressive dessert. Recipe Tip: If you need to make your sauce ahead of time, store it in the refrigerator and reheat it in the microwave in 30 second increments, stirring each time, until hot. 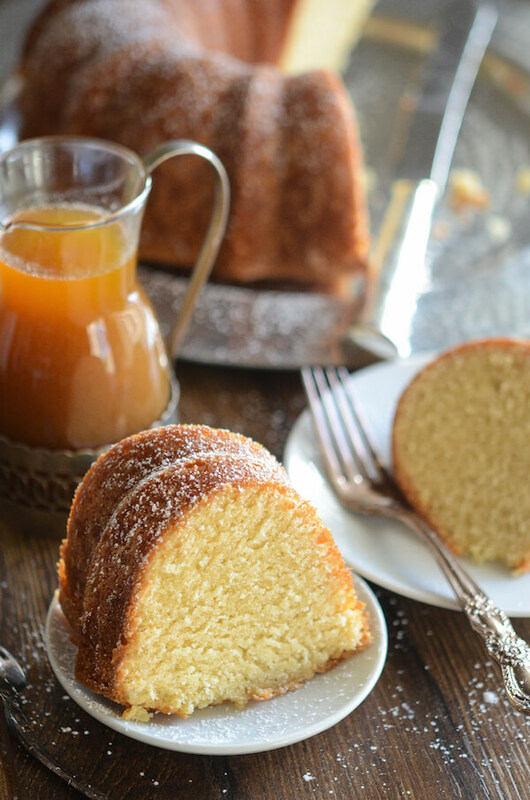 You can use any alcohol that you would like, but amaretto has such a mild taste with light hints of almond and cherry that it works perfectly in this pound cake. I know you are going to love this one! This cake looks and sounds incredible and THAT sauce has me craving a slice right now! The sauce on this sauce is really delicious. The sauce on the cake is delicious. will not print for me either. I know what you mean!!! I want a slice or two right now!!!!! You can make superfine sugar from the regular granulated sugar. 1 cup + 2 teaspoons of granulated will make a cup of superfine. Just put it in the blender for 30 seconds at a time until you have superfine sugar – it should feel kinda like soft sand. Oh my goodness, that looks positively mouth-watering! Gorgeous photos, too! This looks SO good! I love Amaretto. Wow, this looks totally delish. So perfect for the holidays ahead! This looks amazing, I may be overlooking, but does anyone know if there is a high altitude instruction? The sauce recipe is confusing. The ingredients call for granulated sugar but the recipe only says to add the brown sugar….. ? Are the directions missing a step or are the ingredients wrong? Oh, geez………is this yet another example of a recipe being incomplete? I guess online recipes are no different from magazine recipes. Too bad……especially since online ones can be corrected so easily! This cake was a real hit when I brought dessert to a friend’s house for Christmas day! The sauce was so delicious that I will make it again soon to be served over ice cream. Yum! So glad you all enjoyed it Jane! And yes, I use that sauce in so many ways! Hi Geoia, the link to the recipe I developed for Dixie Crystals is at the very bottom of the post where it says RECIPE in all capital letters. Hope you enjoy it! Where is the written recipe ????????? Hi Valencia, the link to the recipe I developed for Dixie Crystals is at the very bottom of the post where it says RECIPE in all capital letters. Hope you enjoy it! I went tot Dixie Crystals…here it is! If there is a recipe it’s not easy to find. Hi Mahmoud, the link to the recipe I developed for Dixie Crystals is at the very bottom of the post where it says RECIPE in all capital letters. Hope you enjoy it! Made it today. Thanks for the recipe. I prefer it without the sauce, but that is just me. Vinegar in milk creates a texture like buttermilk, so you get the benefits of buttermilk without having to buy an extra ingredient. However, if you happen to have buttermilk on hand, you can swap it in place of the milk/vinegar. Thank you for clarifying the vinegar and milk. I did ask that earlier but no one answered. I always have buttermilk on hand and that is what I will be using. This cake looks so delicious and I cannot wait to make it. Thank You again. Please let us know where the recipe is – I’ve followed every link. None lead to recipe. Hi Clare, the link to the recipe I developed for Dixie Crystals is at the very bottom of the post where it says RECIPE in all capital letters. Hope you enjoy it! Hi Barara, the link to the recipe I developed for Dixie Crystals is at the very bottom of the post where it says RECIPE in all capital letters. Hope you enjoy it! I haven’t tried it, but if you do, please share how it turned out! I was thinking the same thing! And possibly topping it with toasted sliced almonds, thinking they would “stick” to the sauce. It would make a lovely presentation!! MISS JESSICA: I respectfully request that you ask the folks at the Dixie Crystals website to update the directions for the Amaretto Sauce to include the granulated sugar along with the butter and brown sugar in the small saucepan. I see where there have been a couple of inquiries regarding the omission and a resulting totally wrong comment that the granulated sugar is in the cake, which leads me to believe that person is putting 3 1/4 cups of granulated in the cake. It’s unfortunate that published recipes are not multi-person proofed to avoid confusion. Step 5. Allow cake to cool completely. Serve warm. So do we microwave it to serve it? I heat up a slice a little in the microwave for about 5 seconds, however you can absolutely serve it at room temperature as well! You need to let the cake cool completely so it comes out of the bundt pan ok, but if you greased your pan super well – you can try flipping it while still warm! What can I use instead of ammaratto in cake and sauce? If I put 4 tablespoons of almond extract will that be too much? Yes, that will be way too much almond flavor. You can use a different liquor of your choosing or if you are trying to avoid alcohol, you can use a fruit juice (I would recommend orange or apple juice). Can you pour the sauce over the entire cake and let it soak in? This looks amazing! For a couple of years now, I’ve been making an almond cake, also flavored with amaretto, from Thomas Keller’s cookbook “Bouchon”. It is always a hit because how can an amaretto drenched almond cake be bad? 🙂 So, knowing how much my family and friends already love this flavor combination, I am definitely going to try this recipe! Thank you for sharing! Hello! I have made the recipe twice already, it’s delicious. But I have a question. Why does my sauce come out milky not like the one on the video that looks buttery and clear? What am I doing wrong? Hmm, I’m not sure. Are you possibly using full heavy cream instead of half and half? 1/2 and 1/2 if u dont have it available to u, is equal parts Heavy Cream and whole milk. Hi there, have you made this cake in cake pans, not a Bundt pan? Thanks! I can’t wait to try this recipe for my dinner party this Friday! Is it best to make the cake the day of and serve fresh? I thought typical pound cake recipes say to make a day or two ahead for best results..?? Please email the recipe for Almond Amaretto cake. Was unable to find it. Can you make this ahead & freeze? And put sauce in refrigerator? Where is amaretto located in grocery store? Amaretto is a liquor and will be sold in the liquor store or liquor section of your grocery store. You have good cake recipes! Do you have recipe of rhum cake? I baked it today and I just got a slice and OMG!!! SO YUMMY! Thanks for this recipe. I didn’t do the sauce and I only put a cup of sugar in the batter. It’s still sweet. And I use eggs and buttermilk at room temperature. I creamed the butter and sugar for 5-6 minutes!! It’s sooo perfect! I love it! Thanks. How much flour for this recipe? I forgot to write down the amount of flour. Help. I started it now. Would have truly enjoyed trying this for Easter dinner, however your site doesn’t include quantity of ingredients, nor does the Dixie Sugar link work to provide as your previous responses indicate. HELP!!! I made this cake TWICE…. once exactly as written, and the 2nd time exactly as the video showed. BOTH times, the cake rose up, spilled over, then deflated. What am i doing wrong?? Am I supposed to be using baking POWDER, or is it supposed to be baking SODA? Directions say baking soda… this batter is absolutely DELICIOUS, so I am crushed that it fell apart whole baking…. I had the same issue! I dont know what i did wrong! I am sorry this happened to you. But I am also glad as the same thing happened to me and I had read so many of the reviews and none said anything about this happening. I would love to make it again but don’t want to have the same thing happen again. I have no idea why it happened. I am an experienced baker ( over 40 yrs worth ) and have racked my brain trying to understand what went wrong. Please send me this recipe via email thank you. The amount of sugar (2-3/4 cups) in the batter scared me a bit, so I reduced it to only 2 cups. The cake was still sweet and was delicious! I will definitely make it again and reduce the sugar once more to 1-3/4 cups. Hi Tracy! It is a liquor you can buy at any liquor store! I was going to pour the sauce over my hot cake like I do my rum cake. Has anybody tried it yet? My cake is in the oven as I type, can’t wait to try it!! The batter WAS delicious!! Hi Ronda, it sounds like you need a larger bundt cake pan. The cake probably sank in the middle because of the overflowing issue. Or if it was underbaked when removed from the oven. Hope this helps! I would like the recipe…. 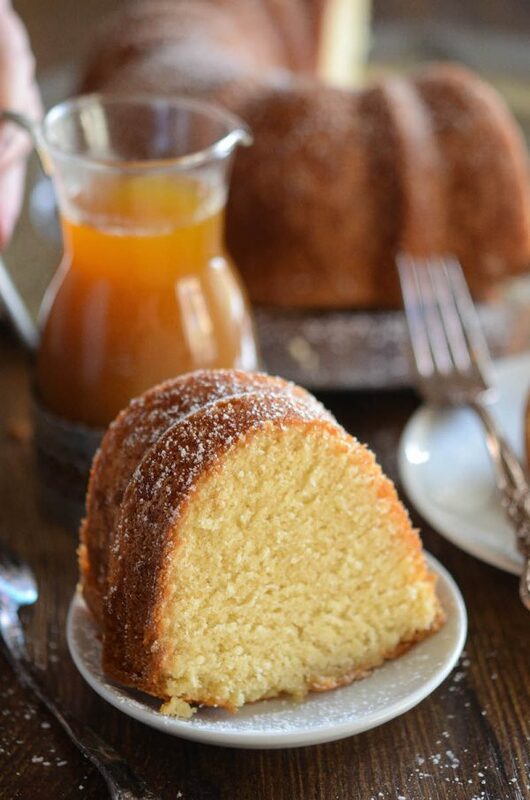 Where is the recipe for almond amaretto pound cake? Yes, where is the receipe for the amaretto pound cake????????????? The recipe I developed for Dixie Crystals is linked to right at the end of the post and many many times in the comments. Here it is again. How would you adjust this temp and bake time for loafs to give at Christmas? Hi Anita, the baking temperature should stay the same. The loafs baking time will depend on what size pan you use. I would say the cake recipe as is would make two loafs. As for baking time, I would recommend you start checking on them around the 30 minutes mark. Good luck! Hi Annmarie! I’m sorry you had this issue! With only 1/2 teaspoon baking soda in the entire cake, I think the issue has to be too small of a bundt cake pan. What size was your bundt pan? I was unable to get this heavenly sounding recipe. Would you please email the recipe. Thank you so much. Can I use regular sugar? I don’t know who sells Dixie Crystals anymore..
Hi Monica, yes you can use any sugar. I buy Dixie Crystals at Publix, Walmart, Target & Costco here in Florida! Please help. I only have distilled white vinegar, apple cider vinegar and white wine vinegar on hand, can I substitute anyone of these for the white vinegar. Also, I have regular granulated sugar or ultra fine sugar, not fine sugar for the almond amaretto pound cake. Also, yes, regular granulated sugar will work perfectly. In the ingredients, why is there an asterisk next to the flour? As of 9/18/17 the link to the recipe does not work. I have tried it several times and also tried the links provided in the comments. None work. I get this message “Page cannot be found.” It is not my computer. 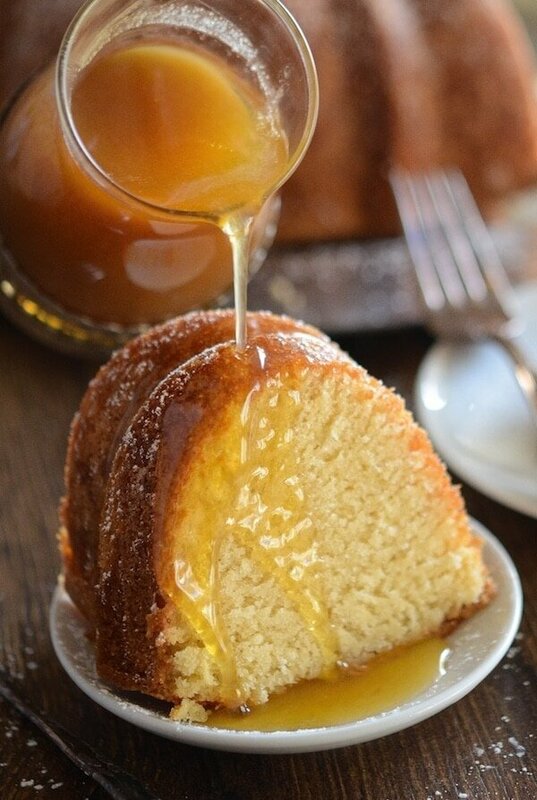 I would like the recipe for the Almond Amaretto pound cake…Thanks in advance. Please send me the recipe for the cake and sauce…thanks. This is a keeper! I’m making it for the 3rd time this holiday season! Question. Could you make this gluten free by substituting almond flour? My husband asked me to make this amaretto pound cake for his birthday since it’s his favorite cake I have ever made. But I do not want him to eat sugar, flour, eggs, butter or alcohol. I still need it to taste good. What can I use instead? I’m thinking Donna is a major control freak! I feel sorry for her husband. He must be really weak to let this thing push him around. Donna, try this recipe. It was the closest I could find. Maybe substitute flour with almond flour and a sugar substitute. Good luck! Could you substitute Limoncello and make it a Limoncello Pound Cake with a Limoncello sauce? Sure! I would use lemon extract instead of almond though! Just as an fyi it is not true that all the alcohol bakes out. I have a couple cook books that are just booze cakes, brownies etc and they state that is a lie. A percentage of it does but not all of it and the higher the alcohol content the more that stays. Can I use almond butter instead of butter & almond essence. No, sorry it will not be the correct texture. What is Almond essence? I did not see that in the recipe. Can you substitute amaretto extract for the amaretto liqueur? I know it’s not intoxicating in a cake but I would have to drive far to a liquor store when the grocery store has the extract. Yes, you can substitute it for apple juice! Does the recipe change if you don’t use the Dixie Crystal products? I can’t wait to try this!!! No, it will be the exact same! HI~The almond pound cake looks delicious, but I couldn’t open nor print the recipe. Any ideas? We made the cake today and it was incredible. Rarely does a recipe deliver on its promise at this level. Can you make the sauce ahead and pour it on and let it cool? Will it be like a glaze? Hi Samantha, no it will not glaze, it is a thin sauce. It’s best poured on as it’s served. Please send me the recipe for this Amerato Cake !! Could you please tell me how much 1 stick of butter weighs? And what is “half and half”? Hi Claire! A stick of butter weighs 4 ounces! And half and half is an American cream that is heavier than milk and lighter than heavy whipping cream. You can use heavy whipping cream in it’s place. Hope this helps! I have not tried it this way, but I am sure it can be done! Send this to my email please. I made this cake and it was a hit at church! Unfortunately, my husband is Celiac and can’t have it using regular flour. Do you think I could do a 1:1 with all purpose GF flour? Or does it need something else to make up for the gluten? I made the cake on Saturday. It is fantastic, everyone who tried it really enjoyed it. I’m ready to use the sauce in pancakes! I’m making another today for work. How does this taste a few days later and can it be frozen? If you do not pour the sauce over the whole cake and only as you serve a slice, it will keep well for a few days. I like to warm a slice for 10 seconds in the microwave before serving it. I have not tried freezing the cake, myself. Can’t print Almond Ameratto Pound Cake recipe!! What’s up???? I’m going to try to make this recipe I believe that the first time something will go wrong I’ll try to do it the right way and make it a treat. Can not wait. sounds delicious I want the recipe!! I have made this twice in a week and everyone absolutely loved it. I have had people ask me to make it for them for a special occasion. I graciously agreed and will includ the recipe. Thank you for the recipe. It is amazing. I have made this recipe and yes! It was a hit! I am a cake baker and pound cake is my favorite. The first time I made this it was perfect, exquisite even. The 2nd time it bubbled over making a major mess (too much baking soda and/or too little flour). The 3rd it was a bit dry I guess I was trying to prevent the previous catastrophe. So I will be weighing the flour I use and try identify the sweet spot for that ingredient. Why oh why with baking being such precise activity, do baking recipes rely on volume measurements for ingredients, when the density of flour can vary greatly depending on technique (as you clearly with your description of appropriate technique) and result in complete success or catastrophe using the same measured volume. Does anyone have a good weight of flour for this recipe? I used 410 grams of flour and the cake came moist and delicious. I also preheated the oven to 340 degrees then turned it down to 325 degrees as the recipe directs. The thinking being the initial extra heat would bring the cake pan up to temp without cooling the oven so much that the element would be so long as to overheat.